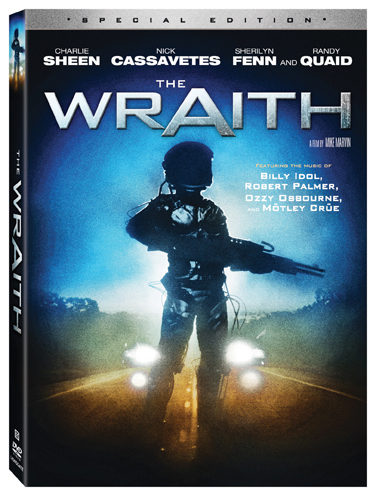 The Wraith, the cult classic starring Golden Globe® winner Charlie Sheen (TV’s “Spin City”), Academy Award® nominee Randy Quaid (The Last Detail, Best Actor in a Supporting Role, 1973) and Clint Howard (Frost/Nixon), comes to Special Edition DVD from Lionsgate this March. The action-packed film tells the story of a mysterious figure seeking vengeance on a gang that’s been terrorizing a small town and includes music from some of Rock-n-Roll’s greatest legends including Ozzy Osbourne, Mötley Crüe, Robert Palmer and Billy Idol. The Wraith: Special Edition DVD features fresh packaging and all new special features including audio commentary, interviews with writer/director Mike Marvin (Sunstorm) and Clint Howard along with a featurette on the Dodge M4S that was used in the film. “FutureCar Revealed!” - a look at the restored Dodge M4S used in the film and the current owner’s efforts to bring it back to life, including a detailed account of the car's history and creation.